Gashimov and Wang Yue drew their games today, but Carlsen defeated Bacrot to join the leaders in the final standings. The three winners share prize money as well as Grand Prix points. Round report and video now added. 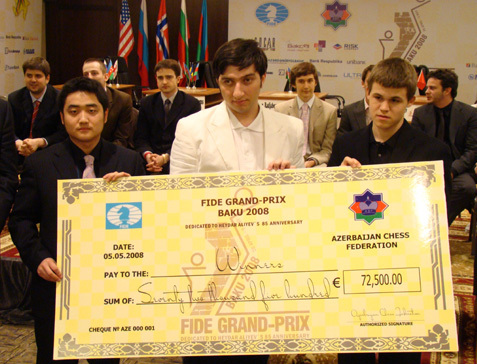 First Grand Prix in the history of chess, was organised in a chess country, in Baku, Azerbaijan. 5th May, at 20:00 Closing Ceremony was organised in the main playing hall. We bring you pictures from the ceremony in Photo Gallery. Chess is cute! Round 13 Photo Gallery is up! Maybe the temperature in Baku is warm, but in the Grand Prix playing hall it's hot and burning. Hearts are beating faster and spectators, organizers, seconds and journalists feel it. What about the stars? Are they human beings, or robots? Round 13 starts at 14:00 hrs local time, 11:00 CET! Live commentary: GM Sergey Shipov comments on the games during the round; Russian and English versions are provided. 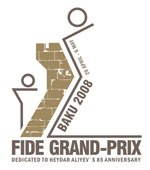 Videos: The FIDE Media Team created many video files from the FIDE Grand Prix tournament Baku 2008. Interviews: Each day one interview will be served at the interview section. Chess Media System: Each round all games will be analysed by GM Zurab Azmaiparashvili and uploaded to this website. To see them, please go to the Chess Media Section. 10 rounds finished! Round Reports: Again, each day there will be round reports (video) commentated by Peter Doggers. Go to the video section to watch them. Press Conferences: Each day all press conferences as seperate video files of each game will be uploaded to website - watch it in Video Gallery. Round 9 All press conferences are up! Shakh: "I will be the World Champion!!"